Instead, we get BNB. He stops on the stage and says he knows he’s not the person Ziggler was referring to, but he believes that Ziggler has something that belongs to him, something he wants. 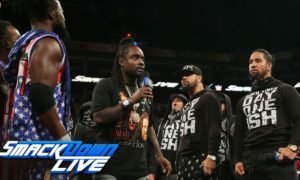 He calls Ziggler a comedian after some remarks, then says people like Ziggler, Luke Harper, R-Truth and Dean Ambrose can play all the games they want. They can steal his championship, but it doesn’t change the fact he’s still the champion. And who does Ziggler think he is, challenging people to WM matches? This is BNB’s match, and his championship. Ziggler can either hand over the belt right now, or BNB will get in the ring and take it from Ziggler’s unconscious body. Ziggler holds the belt, then lays it across the mat. Harper comes from out of nowhere and attacks Ziggler from behind. He stares BNB down as BNB goes for the belt. He gets down to pick it up, but Harper stands on it. The two pick it up and have a tug-of-war until Ziggler nails Harper from behind. The two heels then double-team him, leading to Ambrose charging down to the ring. Ambrose takes out Harper with a clothesline, then he and Ziggler send BNB to the floor. Harper is back up, but he bails. Ambrose and Ziggler stare at the belt, and BNB & Harper try to come back in. The faces brawl with the heels on the floor, and that’s when Truth shows up and hides next to the ring post. As the brawls continue, Truth sneaks into the ring, gets the belt, then hides underneath ring. Ziggler and Ambrose hit the ring, wondering where the belt went. Truth comes out the other side of the ring and heads up the ramp with the belt. Renee Young stops Truth in the back and asks why he took the belt again. Truth says when he heard he was in the match at WM, he came up with a plan. If he has the title under his arm, he won’t have to climb a ladder. Young says the belt will be hung above the ring, and he’ll have to climb the ladder to get it. Truth doesn’t like that idea, so he offers Young the belt. He asks where “Gene Ambrose” is. She doesn’t know, so he says he has to find somebody to take it off his hands. It’s announced that, later tonight, Ziggler and Ambrose will take on BNB and Harper. The champs get an inset promo. They say you’re looking at the best team in WWE. Not only do they have the belts, but they are the hardest-working, no-nonsense professionals in the company. Fact. They’ll be keeping an eye on the division, and if any tag team wants to lose to them at WM, they’ll have to earn it. Fact. Good luck. Kidd starts off with a Matador, who makes a blind tag off a side headlock. The two crisscross until the legal Matador hits a spinning neckbreaker for 2. Kidd backs him into the corner and tags out to Cesaro, who sends the Matador into the corner. Matador blocks a charge and hits a hurricanranrana off the middle rope. The other Matador tags in and hits a spinning headscissors. He ducks a clothesline, but then runs into a tilt-a-whirl backbreaker before Cesaro hits a double-stomp for 2. Cesaro goes into a side headlock before running into a back elbow in the corner. Kidd tries to interfere, but he gets low-bridged to the floor. Matador tries for a tag, but Kidd pulls the other half of the team to the floor. Cesaro goes for a pin with the ropes and gets 2 until Torito points out the cheating to the referee. Matador manages to roll Cesaro up for 2, but Cesaro is back up with a European uppercut. He spots Torito on the apron and pulls him into the ring by his horns. Torito kicks him in the shin and taunts him with a dance. Cesaro goes to grab him, but the ref holds him back. Nattie takes the opportunity to trip Torito. Meanwhile, Cesaro and Kidd hit a version of Montezuma’s Revenge, and it’s enough for 3. WINNERS: CESARO AND TYSON KIDD. The Big Show is in the back with Kane, and he says Kane owes him an apology about Randy Orton. Kane says he may have been wrong about Orton, but he’s not apologizing to Show for anything. Show says that, since Kane is the DOO, he’s letting Kane know he’s entering the Andre battle royal, he’ll win it, then put his own head on the trophy and call it the Big Show Battle Royal. Kane says Show is a giant, but he’s no Andre. Show says that’s a compliment. Kane says he’s in the battle royal as well, and he doesn’t intend to lose. Show says who will show up: the “Devil’s Favorite Demon”, or a spokesman for Men’s Wearhouse? Kane tells him to grab a ringside seat for his match against Ryback later tonight. Kane then does the Men’s Wearhouse slogan. Show stands at ringside, next to the Andre trophy. Kane hits a boot, misses a clothesline and gets hit with a flying shoulderblock. Ryback tries to come off the middle, but Kane meets him with an uppercut. Ryback gets stomped down, then receives several shots in the corner. Kane whips him across the ring and hits an avalanche for 2. Ryback comes back with a neckbreaker off the ropes, then counters an avalanche attempt with a spinning belly-to-belly. Ryback comes off the middle with a falling splash, then hits a spinebuster. He loads up the Meat Hook, and that’s when Show jumps on the apron. Kane tries to attack from behind, but Ryback sees it coming. Kane and Show exchange words, and when Kane turns around, Ryback lays him out with a Meat Hook for 3. Show tries to hit the ring after the match, but Ryback knocks him off the apron. Kane rolls to the floor, where Show begins to berate him. Kane grabs a mic and tells Ryback to stay where he is, because he now has a match against Show. After Show and Kane argue a bit more as the ref rings the bell. He nearly gets counted out, but breaks the count and assaults Ryback with rights. He then hits Ryback with some knees and a blow to the back. Ryback gets corner-whipped, then receives a version of the short-arm clothesline. Show hits a bodyslam, then another. Ryback gets to his feet, so Show headbutts him and sends him to the corner. Ryback avoids a charge and hits Show with a series of shoulder thrusts. Ryback goes for a dive off the middle, but gets goozled. He breaks the hold, ducks a right and hits a spinebuster. The Meat Hook is signaled, and that’s when Kane jumps on the apron. Ryback whips him in, nails Show with a Meat Hook to the back, then hits Kane with a regular one. Show is back up, and he hits the KO Punch for 3. Bray Wyatt appears on the screen and says the Undertaker’s reckoning is at WM, but he refuses to answer its call. Wyatt has something Taker can relate to, and this Monday night on RAW, he will unleash its spirit. Not even Taker can outrun his own fate. Rise, Dead Man. Rise. The camera pans down, and there’s an urn in front of him. Another promo for Sheamus’ return. I really hope he’s coming back as a heel. The Bella Twins come out for Brie’s match, but before that starts, Nikki Bella says everyone is talking about the hashtag #GiveDivasAChance. She agrees with it, but one thing needs to be made clear: It’s not give AJ a chance; it’s give DIVAS a chance, and that’s what they’ve been doing since AJ has been on vacation. Brie says that, while AJ has been resting, the Bellas have been giving all the divas a chance. However, none of them have lived up to the “Bella standard” (oh, sweet merciful crap…). It’s a high standard, and that’s why the Bellas are still here, with Nikki still being the fearless Divas Champion. That is also why they will always be the stars of Total Divas. Nikki says no divas will stop them, including AJ or Paige. There is only one voice in the divas division, and that’s the voice coming from the top. Brie tells AJ to come out with her “frenemy”, because they’re going to give AJ her precious little chance. Dear god, who the hell thought it was a good idea to give the Bellas mic time? Brie counters a lock-up with an armdrag. They go back into the lock-up, and Brie backs AJ into the corner, slamming the back of her head into the buckles. AJ blocks a charge with a pair of knees, ducks a clothesline and hits an armdrag into an armbar. She turns it into a hammerlock, which Brie breaks with a back elbow. AJ comes back with a roundhouse, then slides into Brie’s legs, knocking her on her face. AJ heads to the top and hits a cross-body for 2. Brie hits a back elbow out of the corner and comes off the middle with a dropkick for 2. Brie mounts AJ and slams the back of her head into the mat for 1, then sends her into the ropes for the absolute sh*ttiest clothesline I’ve ever seen for 2. Brie applies a modified rear chinlock, which AJ breaks free of. Brie hits a “clubbing” blow to the back, then hits a low “running” dropkick for 2. AJ gets slammed face-first into the top buckle three times, but then misses a splash. AJ rolls her up for 2, then gets hit with a clothesline for 2. Brie goes back to the rear chinlock, which AJ breaks free from once again. Brie hits a forearm to the back and drops AJ with a DDT for 2. She tries the pin again and gets another 2. Brie hits…something…off the ropes, screaming in her obnoxious voice the entire time before getting 2. She hits a snapmare and follows up with a rolling neck snap for 2. Brie goes back to the chinlock AGAIN. Is she the Randy Orton of the divas division now? AJ fights out, only to get hit with…something…again…off the ropes. Brie hits a knee against the bottom rope, then comes off the middle for another dropkick. AJ avoids it, and Brie lands on her stupid face. AJ hits a Thesz press and peppers Brie with rights. AJ hits a corner clothesline and a neckbreaker. She connects with a spinning back kick, then sends Brie to the floor with a seated dropkick, right in front of Paige. Nikki tries to get between the two as AJ sends Brie back into the ring, where she applies the Black Widow. Nikkie tries to interfere, but Paige yanks her to the floor while Brie taps out. Renee Young is standing by with Daniel Bryan. She says it seemed like Dolph Ziggler was referring to him earlier. Bryan moves away from that and talks about the IC title match at WM, then says Ziggler might be right in that the match could steal the show. As for tonight, he can’t wait to see who ends up with the title belt. Alundra Blayze is announced as the newest inductee into the Hall of Fame. Very deserved. Mizdow leaves his sunglasses on as Miz applies a headlock on Kofi to start the match. Miz hits a shoulder off the ropes, goes into a crisscross and gets hit with a back elbow. Kofi hits an armdrag into a float-over for 1, right into a standing armbar. Miz gets a rope break, kicks Kofi in the knee and hits a snap DDT. Mizdow looks for a tag as Kofi starts hitting Miz with strikes. Miz gets a kick off the ropes, and Mizdow tries for a tag again. Miz ignores him, and then gets hit with a dropkick. Mizdow tags himself in to a big pop, hits a pair of clotheslines and then drops the Reality Check. Mizdow finally takes his glasses off after a kip-up. We see the tag champs and Natalya watching this match on a monitor backstage. Meanwhile, back in the ring, Mizdow goes for the figure-4, but Kofi kicks him away. Mizdow stays on his feet and hits a big boot. Miz is back up, and he tags himself back in before brow-beating Mizdow. He orders Mizdow out and all the way to the floor. Mizdow does as he’s told and turns his back on the match. Behind Miz, E tags in, and he & Kofi hit a combination Big Ending and flying DDT for 3. WINNERS: BIG E AND KOFI KINGSTON. Mizdow smiled as he heard Miz lose, and now Miz is screaming at Mizdow for doing exactly as he was told. Byron Saxton recorded an interview with Roman Reigns earlier today. Before that, we are shown a video package for Brock Lesnar. Saxton points out what we just saw to Reigns, as well as the comments Paul Heyman had for Reigns on RAW. Reigns says Heyman has made a living out of running his mouth and lying, but he did put one piece of truth out there: Lesnar will hurt Reigns at WM. Look at him. Everyone who steps in the ring with Lesnar gets hurt or taken out. Look at the Undertaker. Look at John Cena. Reigns knows he will feel pain and get hurt, but he also knows he can take the punishment. After Lesnar gives Reigns everything he’s got, Reigns will stand up, lock-and-load, and hit him right on the button. When Lesnar’s knees are shaking, and his legs are wobbly, Reigns will cut him in half with a spear and win the WWE World Championship. Whether Heyman and Lesnar want to or not, they will believe that. Oh, great. This match again. Rusev starts with a boot to the gut, then tosses Swagger to the floor. Swagger fights back on the floor with rights, then rolls Rusev back into the ring. Swagger hits a clothesline, then tosses Rusev to the floor this time. Commercials. Back from the break, Rusev hits a kick to the ribs and lands what I think is supposed to be a dropkick for 2. Rusev repeatedly stomps Swagger in the chest, then kicks him in the spine. Rusev drops a series of elbows to Swagger’s neck and shoulder, then applies a rear chinlock. Swagger manages to free himself, but Rusev tightens his grip and gets the hold back on. He then breaks it himself to give Swagger a headbutt. Swagger reverses a corner whip and hits an avalanche. He then whips Rusev across the ring and hits a clothesline. He goes for the Swagger Bomb, and Rusev tries to block it with a foot. Swagger sees the block coming, grabs the foot and applies the Patriot Lock. Rusev quickly gets to the ropes and rolls to the apron, where Swagger knocks him to the floor. Outside, Swagger rams Rusev into the barricade before rolling him back in. Rusev gets back to his feet and hits the thrust kick. He stomps Swagger in the back and applies the Accolade for the tap-out win. As Rusev is celebrating his win, Curtis Axel appears on the TitanTron. He says not to change the channel, because Axelmania is running wild. Rusev, let him tell ya something, brother. You still don’t have an opponent for WM. Axel knows Rusev is still undefeated in WWE, just like Axelmania is still undefeated in the Royal Rumble match, 39 days and counting, brother. Often imitated, never eliminated, dude. But he’s coming after Rusev. This Monday night on RAW, Axel vs. Rusev, brother. When Axel puts Rusev down in the ground, 1-2-3, he’s coming after the US title at WM, brother. So Rusev, whatcha gonna do? Whatcha gonna do, Rusev? Whatcha gonna do when Axelmania runs wild on you? Now we’re getting a promo from Cameron. She still has a job why? She says there’s been a lot of talk about #GiveDivasAChance. You know what? It’s about damn time they give Cameron a chance. Hey, it’s more uselessness with Summer Rae as she can’t believe Cameron is serious. It’ll be Summer Rae’s time, because it’s Summer Time (Oh, god**mit). Oh, yay. To complete the trifecta from hell, Eva Marie has joined the segment. When she’s around, these two. Have. No chance. That’s how she said it. Take it up with her. We’re about to start the main event, and R-Truth is on commentary, still in possession of the IC title belt. Ziggler and Harper start, with Harper quickly going for the Gator Roll. Ziggler counters into a side headlock, which Harper counters into one of his own. He comes off the ropes with a shoulderblock, goes into a crisscross, then catches Ziggler off a leapfrog. Ziggler counters into a sunset flip, but Harper pulls him back to his feet. Ziggler ducks a clothesline and hits a dropkick. Ziggler goes for the leaping DDT, but Harper tosses him onto his face. BNB tags himself in, which Harper doesn’t particularly like. Meanwhile, Ambrose has also tagged in. BNB turns around, misses a clothesline and gets hit with a cross-body into some punches. BNB gets thrown to the corner, where Ambrose stomps him down. He grinds his forearm into BNB’s face, then lights him up with some chops. BNB gets sent into the corner, where Ambrose hits him with a splash and a bulldog. Up top, Ambrose hits a vertical flying elbow for 2 as Harper breaks it up. Ziggler knocks Harper to the floor right before Ambrose clotheslines BNB to the floor on the other side. Ambrose and Ziggler have a bit of a staredown as we go to commercials. Back from the break, BNB has Ambrose in a rear chinlock. Ambrose fights out with jabs and a headbutts before BNB hits him with a back elbow off the ropes. Harper tags in and hits an elbow off the ropes for 2. He applies the Gator Roll again, then hits a suplex for 2. Harper applies a rear chinlock, which Ambrose counters with a jawbreaker. Ambrose snaps off some jabs and chops, but gets sent onto his face when Harper blocks a kick, which gets 2. BNB tags in and sends Ambrose face-first into the buckles, then hits him with some shots. Ambrose gets whipped, blocks a charge with an elbow and hits a tornado DDT. Ziggler and Harper tag in. Ziggler hits a corner splash and a spinning neckbreaker. The Shot to the Heart connects for 2. Harper avoids the rocker dropper. Ziggler responds by avoiding the big boot and hits the leaping DDT for 2. Harper blocks a hurricanrana attempt, which Ziggler then turns into a sit-out facebuster. Harper comes back with a scrapbuster for 2, which is broken up by Ambrose. BNB sends Ambrose into the ropes with a boot, which leads to the rebound clothesline by Ambrose. BNB and Ambrose head to the floor, where BNB sends Ambrose into the barricade. Back in the ring, Harper signals for the discus clothesline, which Ziggler avoids by hitting the superkick. He quickly follows up with the Zig-Zag, which is good for 3. WINNERS: DEAN AMBROSE AND DOLPH ZIGGLER. As Ziggler is celebrating, he turns around right into a Bullhammer by BNB. Ambrose hits the ring, and BNB puts him down with a boot. He looks around for his title, when he spots Truth at ringside. Truth gets up to leave, but BNB stops him and orders him to hand the belt over. Truth looks at it and starts to give it back, but Ambrose wipes BNB out with a suicide dive before that can happen. Truth puts the belt back on his shoulder and heads up the ramp, only to have Harper stop him. Truth tries to go around, but no luck. Truth drops the belt and offers it to Harper. Harper goes down to grab it, so Truth kicks him in the face and takes possession once again. Daniel Bryan’s music hits, and he meets Truth on the stage. Truth smiles, looks at the belt and hands it over before getting a “Yes!” chant started. Bryan then celebrates with the belt. The celebration is cut short, however, when Stardust nails Bryan from behind and takes possession of the belt. Stardust climbs a ladder set up on the stage and holds the belt over his head.